Chantilly is Fig Tree’s spring collection and it is every bit as sweet, fresh, and romantic as it sounds. Lovely prints, and the most lusciously soft colors. we chose 12 of the low-volume prints and have bundled them into packs of 12 fat quarters…plus mom is working on a new quilt featuring these summery fabrics. we have the low volume Chantilly bundles available now. New DMC perle cotton no 8 has arrived and i’ve been whipping up tin collections of 8 colors…when the lovely Chantilly arrived i knew i needed to put together a tin of Chantilly-Inspired threads. 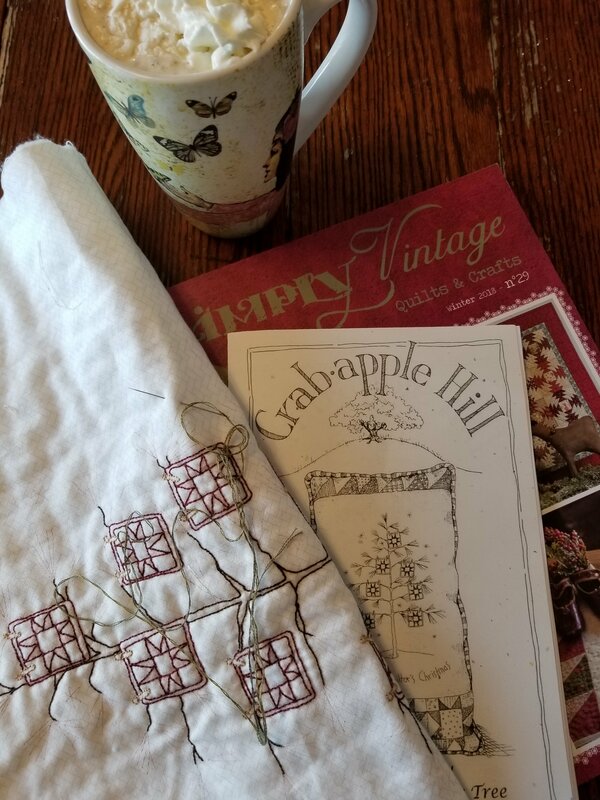 good morning…hopefully you are enjoying the sunshine and maybe even spending some time stitching on the porch, deck, or in a sunny spot in the sunroom. i’ve whipped up 2 rows of lucy then thought maybe i would take a mini break for a few days…work on some of my other favorite things…embroidery, cross stitch, crochet, Sashiko, and ribbon embroidery. 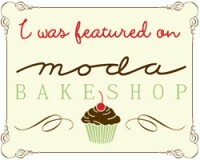 yes…we’ve decided to add a little bit of ribbon to the needlework section of the shoppe. we have some ribbon sets…i’ve reordered some ribbon sets along with some ribbon embroidery kits and am waiting on those. Mrs. Billings has been put on stand-by until i get lucy finished…i’m so excited to see my Lucy’s Summer Cottage all done…that i don’t want to work on anything else. i have had lots of fun working on a few other projects though…a couple small finishes in between a large undertaking like Patchwork of the Crosses…is always nice! yesterday mom stitched my Le Poulet pincushion into a pincushion for me…i love it…the little chicken, the checkerboard, the pretty red chosen for the letters…they all combine to complete a truly delightful little pinny and i hope it receives the kind of love the original pincushion did. Le Poulet kits are available now…online and in-store…a wonderful addition to your cross stitch library. projects from top left Hallowe’en Greeting (on table), My Pink Rose, My Heart is Home, Le Poulet, and In Full Glory. Morning Star project on left…has been MIA since last June…not sure what happened but quite sad that it has disappeared. we do have kits and i will probably break down and stitch up another at some point. today’s agenda after lunch is to ship out some orders, impatiently wait for Chantilly fabrics and more DMC perle cotton no. 8 to arrive…then onto cutting bundles, taking pictures of the new cross stitch patterns, silk ribbons sets, perle cotton no 8 tins, and maybe i’ll even get a chance to list a few goodies online this afternoon. lastly…we’ve come across a kit of our Hot Cocoa Cottage Chic edition…we thought these lovely had all found homes…but there is just one left…we have it available online with the option to add on the Dusky Petals tin of DMC perle cotton no 8…yummy for spring! good afternoon! we hope you are having a wonderful December. we popped into town to get our Christmas tree on Sunday night…then we pulled out the lights and the beads and the ornaments and set to work. this year we opted for 3 trees…1 real, 1 small artificial, and the feather tree from the shoppe i brought home. the real tree is packed full of soft and sweet ornaments, vintage beads, candle lights…very pastel and pretty. the other 2 trees are Christmas Past trees…the small artificial tree has some of our childhood ornaments…my Styrofoam star, my puzzle wreath, tina’s repunzel-angel, and felt bells with our kindergarten/first grade pics. the feather tree we opted for bubble lights in memory of Grandma Zimmer and bulbs from when Mom and Dad were first married and some soft pink bulbs i found at Hollyhock Cottage several Christmases ago. Needless to say, the house is very Christmas-y…just need to get shopping so we can get some presents wrapped and under the tree. 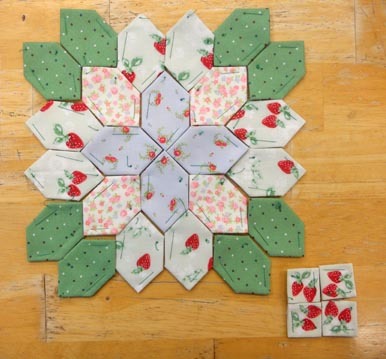 speaking of shopping…i thought i would pop in and update you on Lucy blocks. i’m still trying to get my Christmas pillow all done and working on my Mrs. Billings triangles. i did a check of the Lucy Block kits and some are either sold out or there are just a couple left. keep in mind…that these are a limited run type thing, and right now i am not planning on making any more blocks. i may decide to substitute fabrics in the kit…if i decide to do that i’ll make sure to let you know in the listing. these are some that right now are limited to 1 or 2. Summer Cottage block #7 EDIT: i’ve found some green strawberries so there will be 8 more kits available. Right now these are the kits that i can only find 1 or 2 of and do not have enough to make any more. i’ve linked them above in case you’d like to add them to your Patchwork of the Crosses. 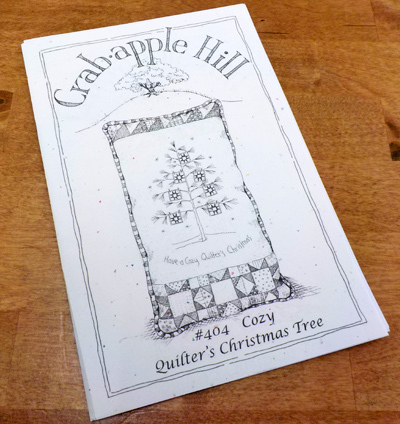 i’ve been neglecting my EPP to whip up the Cozy Quilter’s Christmas Pillow by Crabapple Hill…and it is nearly done! patterns and floss have been ordered and (fingers-crossed) will be here by the end of the week. here is a sneaky peak of the project…i’ve gotten the embroidery all done…just waiting on the piecing part…maybe tonight! 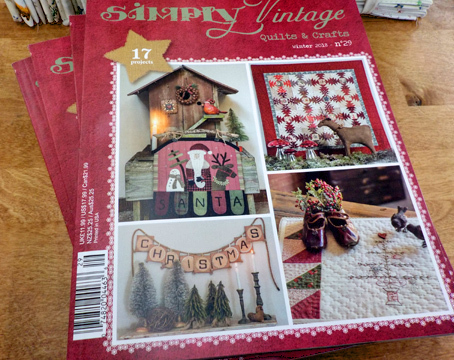 also…we have only 1 Simply Vintage Christmas/winter issue left if you’d like a little bit of Christmas inspiration. 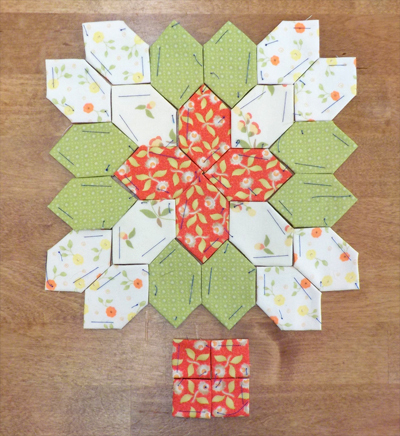 Cozy Quilter’s Christmas pillow (i only have patterns available right now…kits should be available end of the week). good morning! hopefully you’ve had a wonderful thanksgiving. ours was full of family, doggy kisses, delicious food, and a Clue playing marathon…poor Tina didn’t win a single game. now that thanksgiving is over i am far more excited about Christmas. i love pulling out the Christmas boxes and faffing the house with a little extra coziness that Christmas brings. i love the smell of pine, the soft Christmas carols, twinkling lights, and neatly wrapped presents. 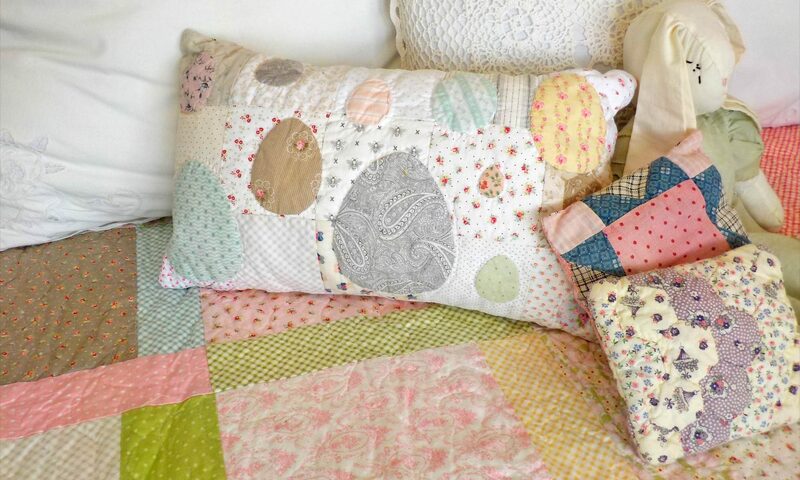 if this embroidered/quilty pillow isn’t really your thing…we also have EdMar Christmas kits available…kits include all the threads (including metallic if needed), beads, preprinted pattern on white, needles, and complete instructions. if Brazilian embriodery isn’t your thing either…last year i pulled my favorite Christmas Cross stitch patterns and you can check them out as well…Christmas Cross Stitch. 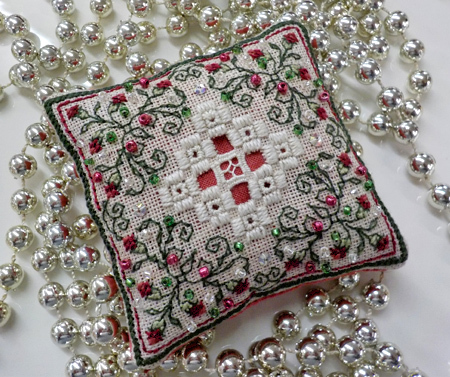 and if cross stitch isn’t your thing or you prefer working on something a little bit smaller…this Teenie Hardanger IV project could right up your alley. cranberry and pine mix with ecru and beads…tuck in a little bowl with potpourri, pine boughs, and bulbs. 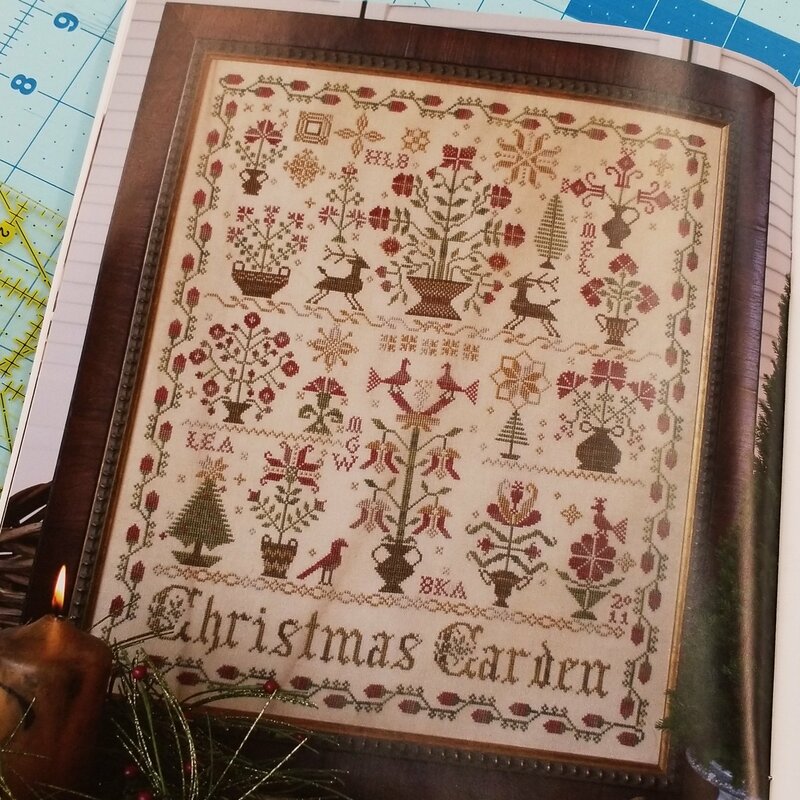 if you are looking for some inspiration…the new Simply Vintage winter edition by Quilt Mania is brimming with winter-y and Christmas-y projects including quilts, wool appliqué, embroidery, and Christmas crafts. 17 different projects total to get you in the mood for Christmas. mom is going to stitch up the little piece on the bottom right. it is just delightful, dainty, and darling, and she already had a place for it. i’d better get on over to the post office and check the mailbox. could have gotten some of my cross stitch supplies that i’ve been impatiently waiting on. 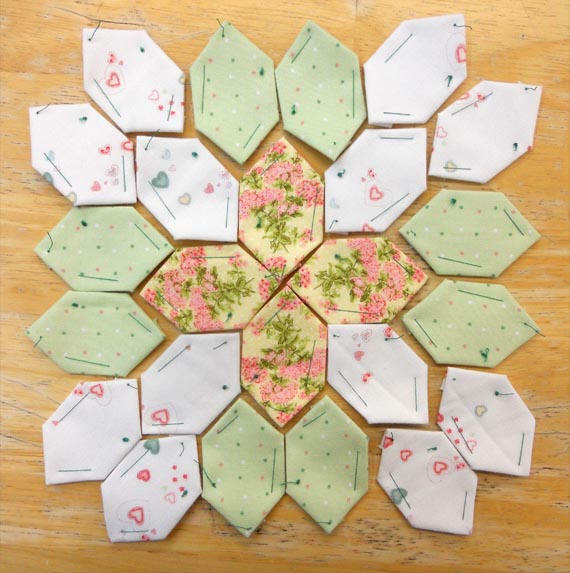 i’ve only had a chance to get a few pink squares basted…and maybe one 9-patch surrounded. 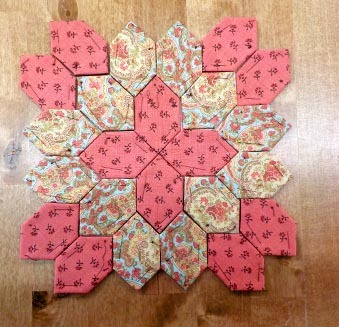 i’ve worked on a couple hexie triangles for the Mrs. Billings border. Christmas Garden is from the Home for the Holidays book by Blackbird Designs. 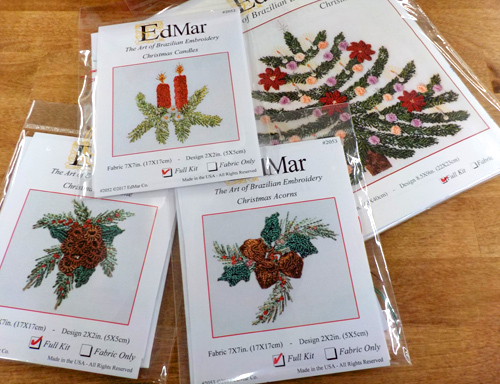 i could hardly wait to get these new little Edmar kits and this fabulous book online! this book is stuffed FULL of sea creatures, bugs, butterflies, birds, flowers, and bouquets. over 100 traceable designs, over 50 stitches and all pictures are in color! absolutely glorious…hours of gawking, drooling, oooing and aaahhing, and hours of stitching once you pick your favorites (which is going to be difficult!). perfect for an i spy project, under the sea stitchery, or add these darling motifs to your crazy quilt. Sunshine’s Fantasy World is available now! 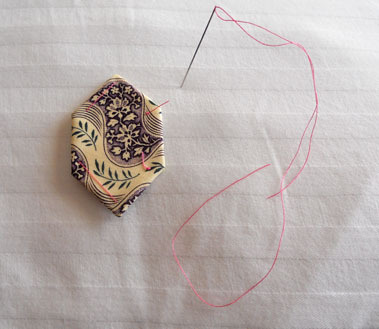 if you are thinking of trying it but want to start small…this California rosebud is up your stitching alley. this delightful little rosebud is available in 3 colors, peach, plum, and pearl and are ready to ship so you can get started…kits include all the threads, instructions, printed trigger cloth, and needles to complete project. 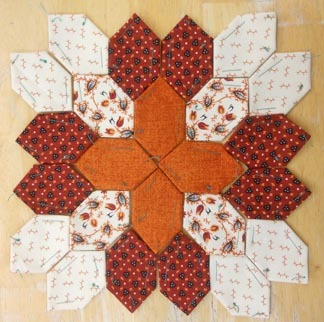 here is the link to the kit…California rosebud.